Orthodontic tooth movement is based on force-induced periodontal ligament and alveolar bone remodeling. 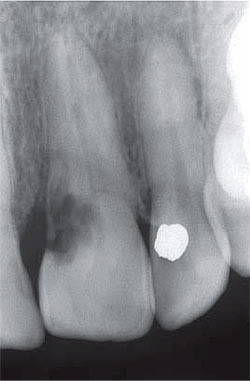 Necrosis of periodontal ligament on the pressure side with formation of a cell-free hyaline zone followed osteoclast resorption of the neighbouring alveolar bone and bone apposition by osteoblasts on the tension side are the well-described typical histological characteristics of these processes. The resorption process of dental hard tissues seems to be triggered by the activity of cytokines as well as that of bone. Immune cells migrate out of the capillaries in the periodontal ligament and interact with locally residing cells by elaborating a large array of signal molecules. External root resorption (ERR) is a problem observed in association with orthodontic movement. The factors relevant to ERR can be divided into biological and mechanical factors. For mechanical factors, the extensive tooth movement, root torque and intrusive forces, movement type, orthodontic force magnitude, duration and type of force are involved.